Hi guys~! 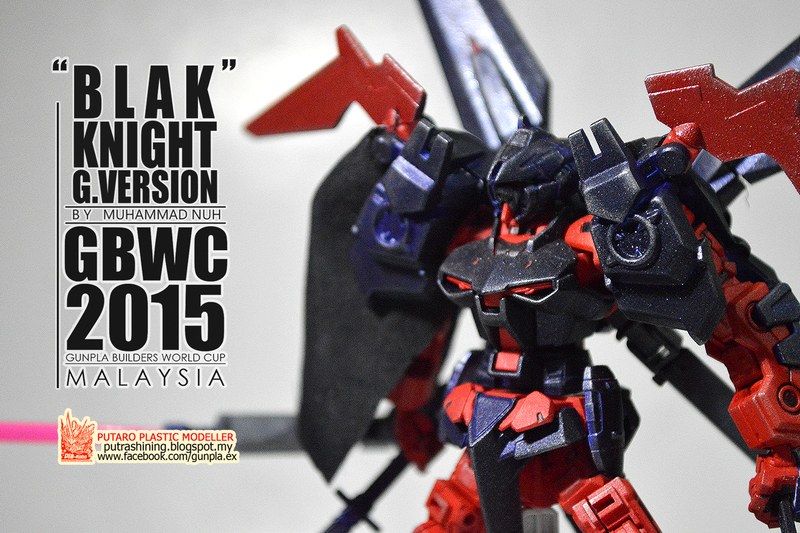 I present to you, one of GBWC 2015 Malaysia entries, Black Knight! A work from a friend. His first time custom build and first time entering the GBWC. 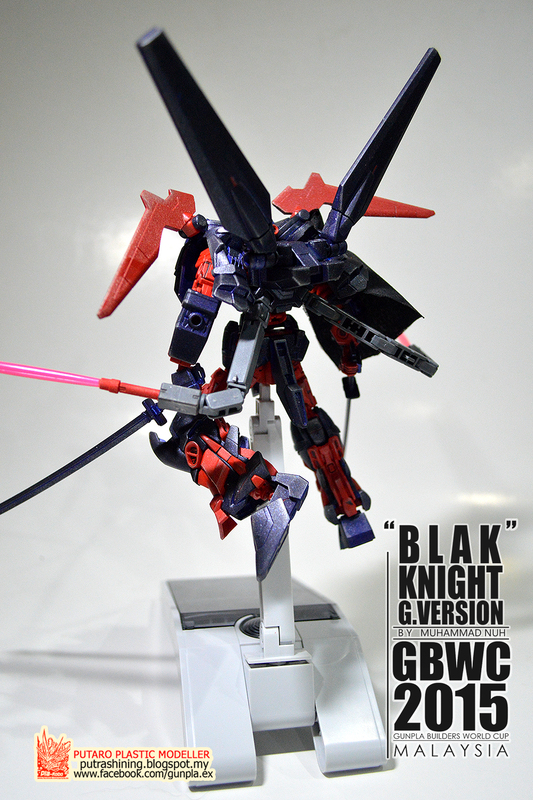 This is the 4th post of our small group's GBWC project. 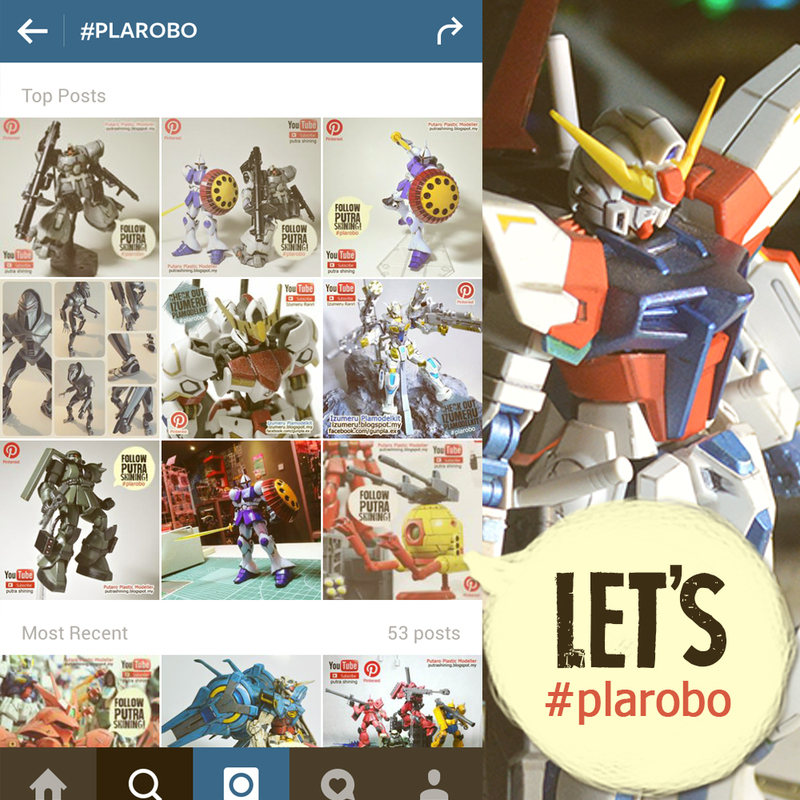 Before this is The Last Pulse by Putra Shining, Zaku by Bie Levine and Prime Saga by Emirythm. We have some new blog, check out Izumeru's blog and Shizuren's blog. 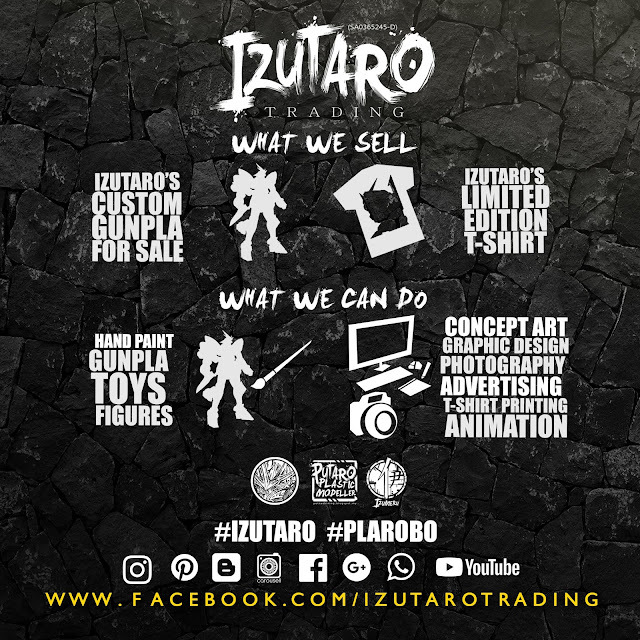 We starting to sell online t-shirt but only in malaysia. We will go international soon. 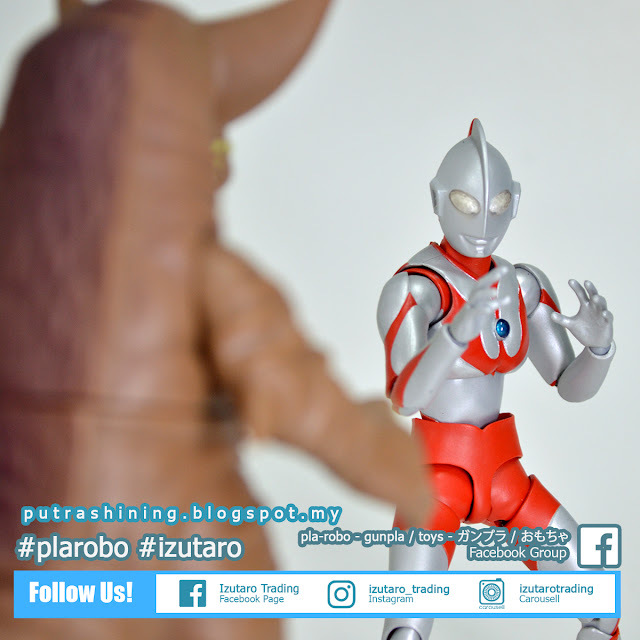 Thanks for viewing Putaro Plastic Modeller! "To begin with the post, I shall introduce myself. My name is Muhammad Nuh. 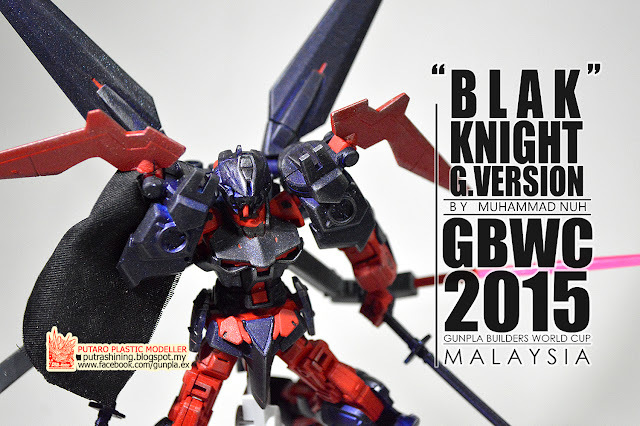 I prefer to be called as Nuh or if you feel want to be a bit Japanese-que, you may call me Haru.Firstly... thank you Putra for posting the images of my... not really great masterpiece, since it's my first attempt to participate in GBWC Malaysia.Second, I shall introduce the Gunpla I customized, Blak Knight G. Version. 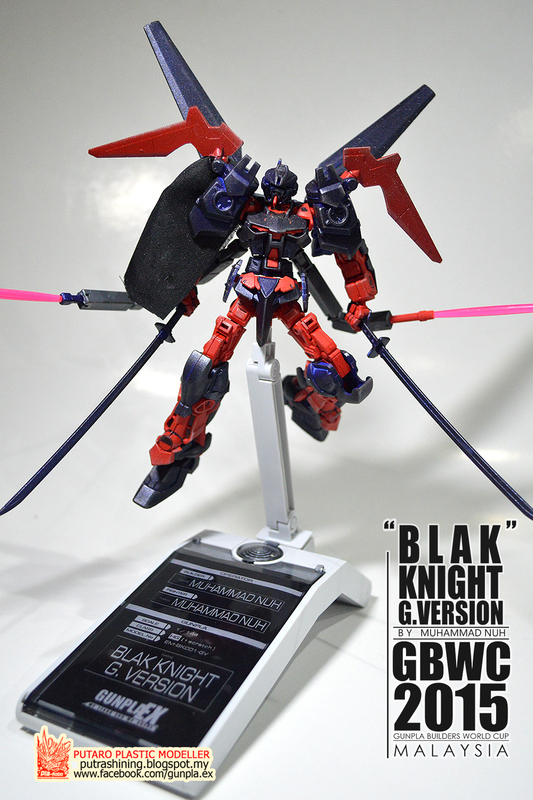 Actually the intended name was Black Knight G. Version, but since I mispelt it when I wrote the submission form, so.. 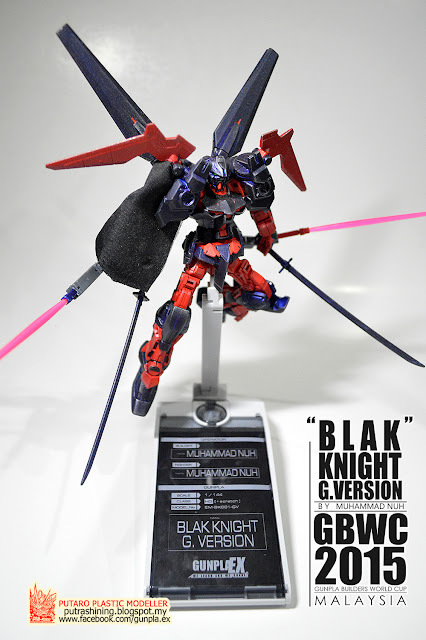 I went ahead with the Blak Knight. 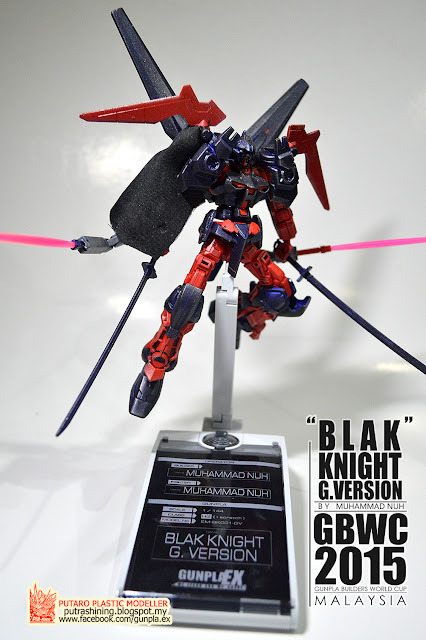 Hard to say about how the name originated or inspired from, since it was originally based from my own avatar, Kusanagi Haru in his Black Knight form, the wielder of raging black flame sword. Due to his bad tempered, easily frustrated with friends and loner personality, he's unable to be happy. I converted the idea into Gunpla form, by using Sengoku Astray Gundam as a base Gundam, and some parts from Gundam X Maoh and other Gundams (Thanks Izumeru and Putra), with the colour that almost close to the black and red as secondary colour, it symbolized his dark side, his rage and loneliness. 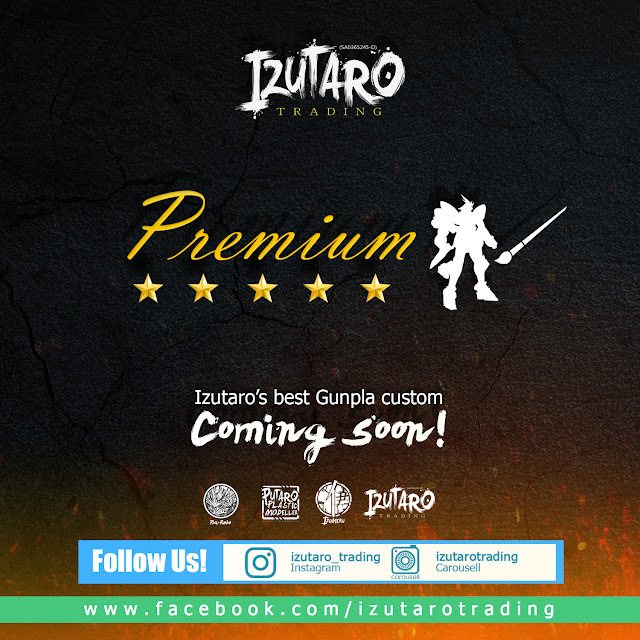 Due to the feeling of incomplete-ness of the work because I personally prefer to colour it in black but Putra told me that black colour will make the Gunpla dull and it will be nothing more than a shade. 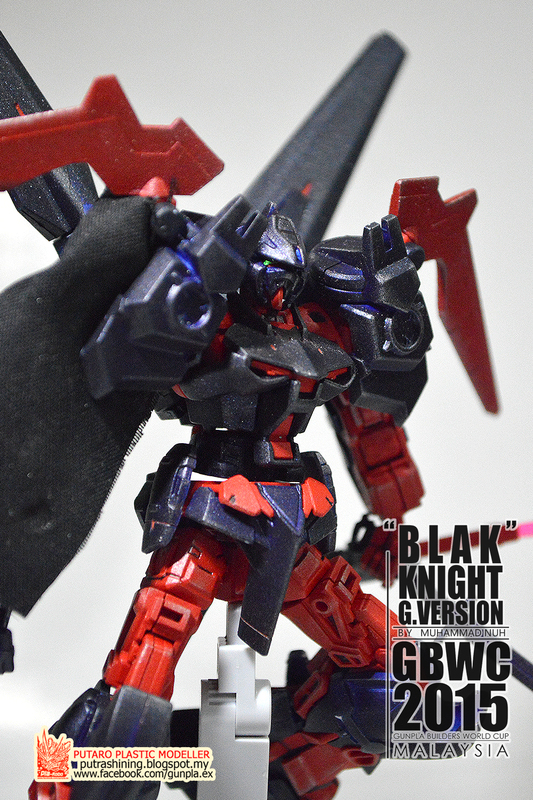 Still, good to know that it was mispelt as Blak Knight (hahaha, what I rambling about...), and it does make sense...To describe the materials used for this masterpiece, I used Sengoku Astray Gundam, parts from Gundam X Maoh (the X Solar system panel), Samurai colour spray (I used Sparkling Blue and Red). 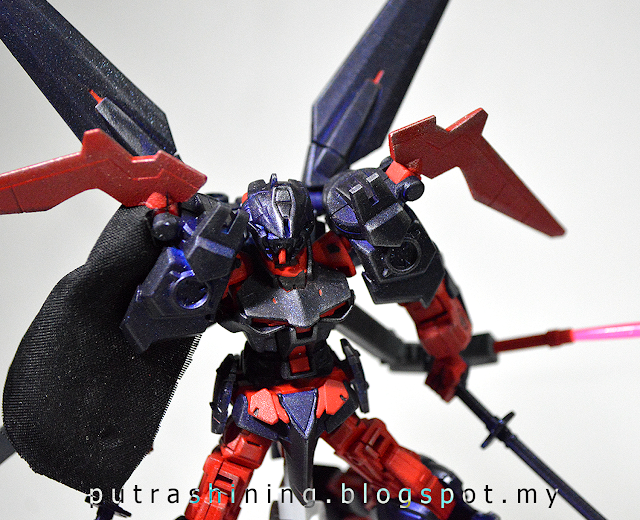 Tools involved here were nippers, gundam markers, some glues, along with nippers, cleaning kits etc. Sincerely said, I just gamble everything I have, because I do not have the clear idea what I intended to do, but with some fiddling around with my own built gunplas after he get me a Sengoku Astray Gundam, I knew what kind of gunpla I am going to built. Camping at Putra's house, and with support of my assistant worker, Li who is my partner in my own part-time job, along with Putra himself and his friends, with some.. err fun and made the house into workstations, things could work on. 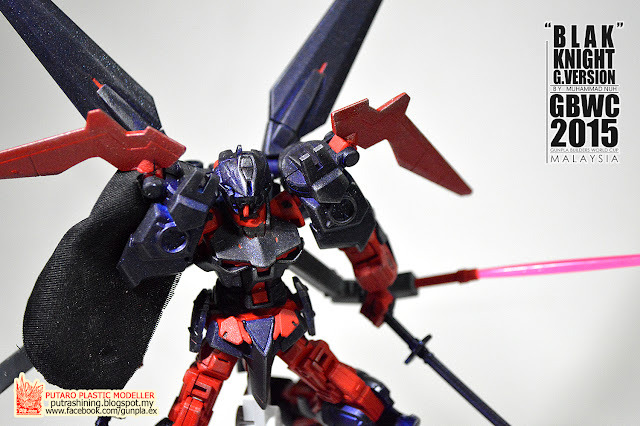 The main problem for this gundam to have the desired form, was the attempt to attach the X Solar Panel booster with the back of Sengoku Astray. 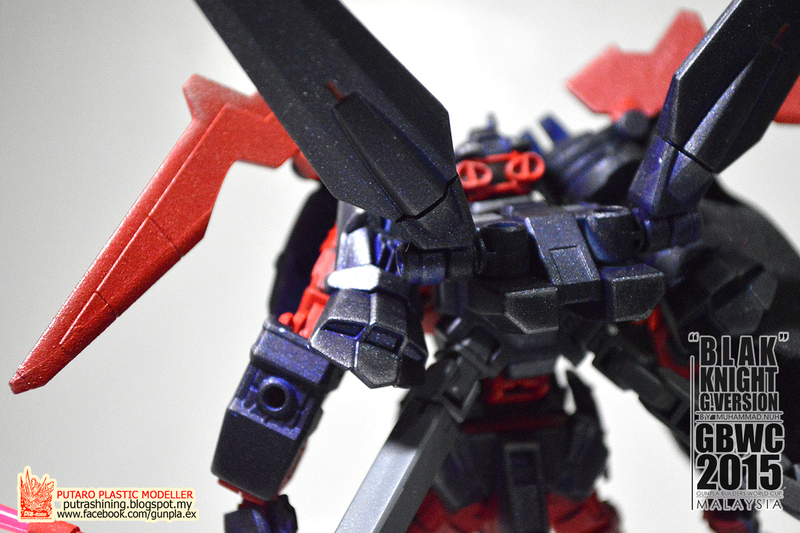 Using the glue didn't work, it made the gunpla easily detached by itself, so, drilling was the resort to combing both parts to make the gundam. Another problem was... the funds. 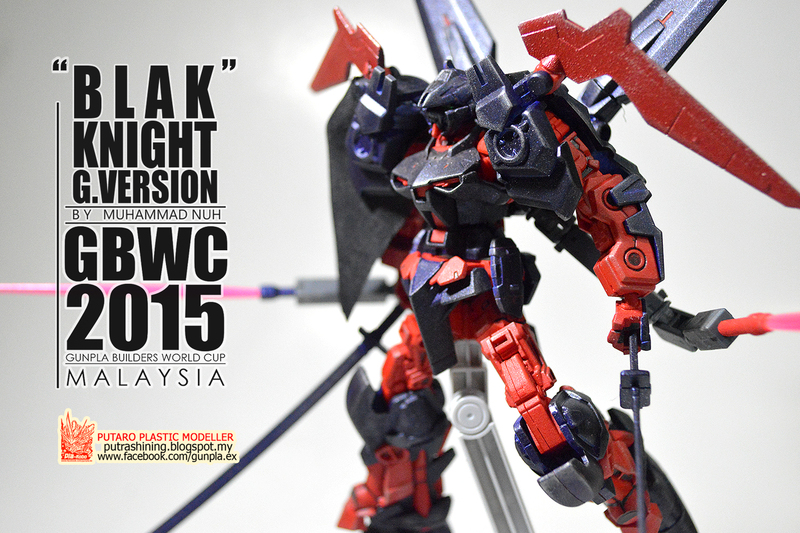 It begin with sudden invitation from Putra, requesting me to enter GBWC as the team. I didn't even have the idea what I can do at the time because I do not have much funds, to add more with my financial conditions, since I came from poor side of the family. He got me the Sengoku Astray Gundam for the contest. 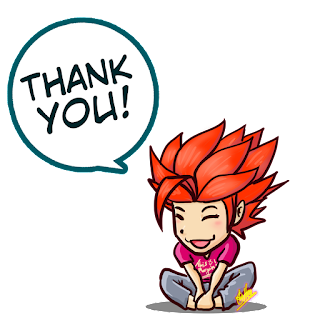 (Again, thank you. )Well, I learned many things. 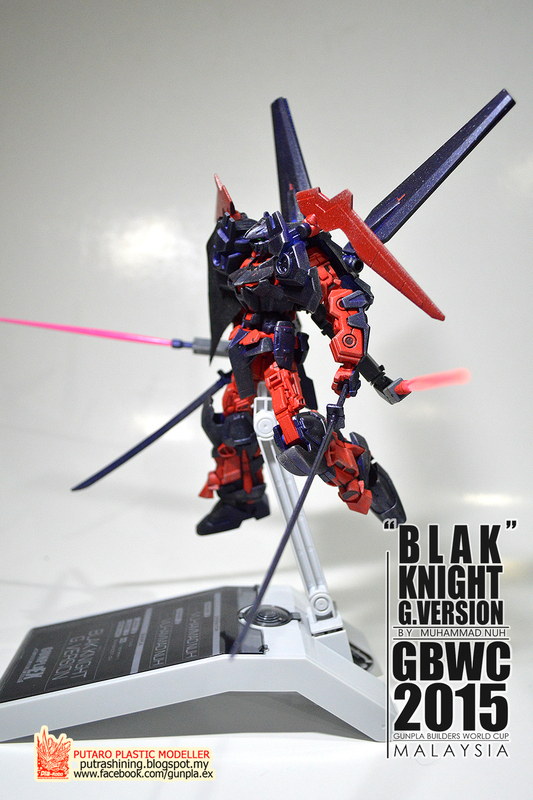 Customizing the gundam into your own taste was the best part. Not limited to the base concrete, canonical reference from the original series of the gundam, people can go beyond from it. The third Meijin said, Gundam is freedom. 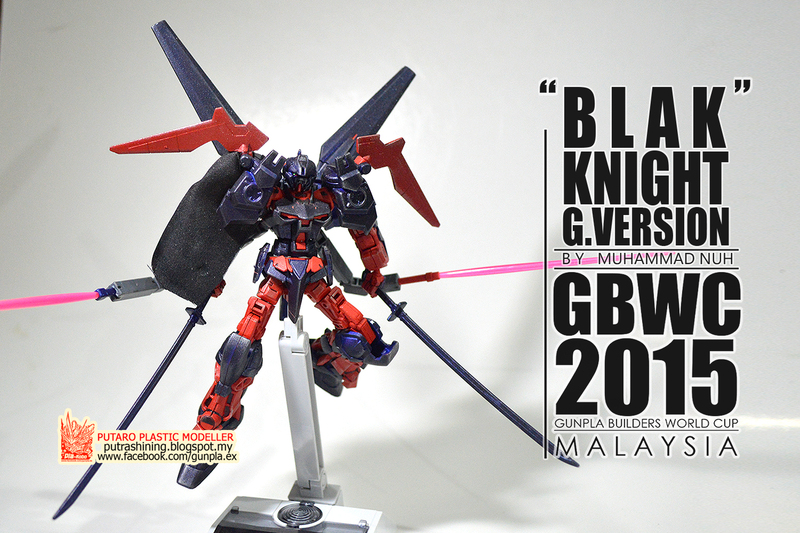 I hope I can finallized the final version of the Black Knight for GBWC this year. Or.. 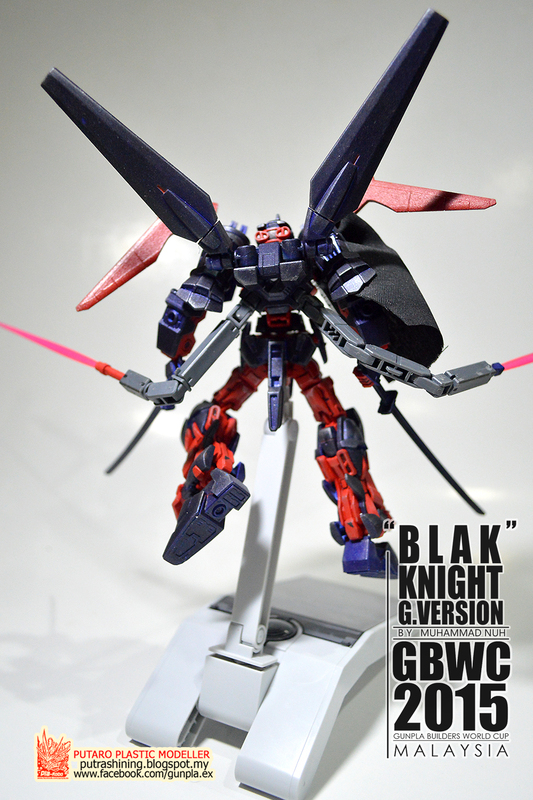 I might make Victim Gundam..."